Our Wildlife Program is a community service provided by the Long Beach Animal Hospital. In this program we provide free medical care for injured wildlife. We routinely care for over 1,000 injured animals each year, and successfully releases almost 50% of them back into their native habitat. This success rate is due to the hard work of all the volunteers and staff of our hospital. This is nothing wrong with this chick, found on our roof. It is such a nice picture we thought it would be great time to let you know that wildlife exists everywhere, even in our urban environment. Can you tell what it is and how old it is. The fact that there is an egg behind it is a good clue to its age. We work closely with the California Department of Fish & Game to ensure that all state and federal laws are followed. Many of the injured wild animals brought to us come from Fish & Game, Long Beach Animal Control, lifeguards, and regular Joe citizens. 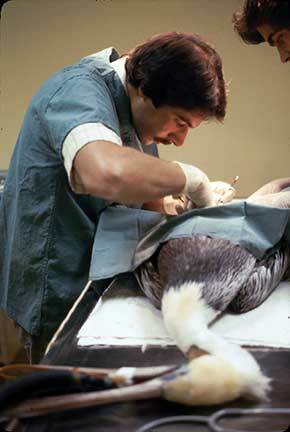 Dr. P has been working with wildlife since he first became a veterinarian in Michigan in 1978. This picture is when he was a at his first job as a veterinarian when he was 24 years old. 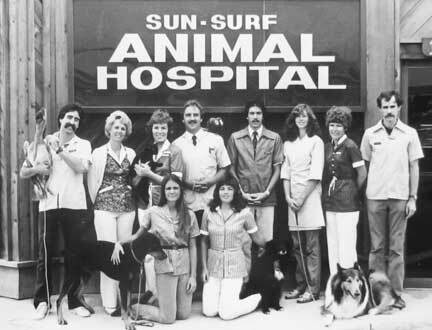 Dr. P has been treating wildlife at the Long Beach Animal Hospital since 1989. This article in the Long Beach Press Telegram is about a fox that came to LBAH after a golfer hit it with a golf ball. His front leg was so badly fractured that it had to be amputated. It was amazing how fast he took off on 3 legs when he was released weeks later! At least this fox had his 5 minutes of fame in the local newspaper! Dr. Wood will be working as the primary doctor for all the injured wildlife brought to our hospital. Here she is examining a peregrine falcon. We are a registered teaching hospital with the veterinary schools throughout the country through our externship program. Externs are senior veterinary students training with us as part of their veterinary school curriculum. During this training we involve our externs in the care of wildlife. We want them to learn the importance of conservation medicine early in the careers, and the tremendous need for this, as wildlife is being encroached upon with the burgeoning human population everywhere. If you follow this Wildlife Photography link you can see this as Dr. P travels the world. 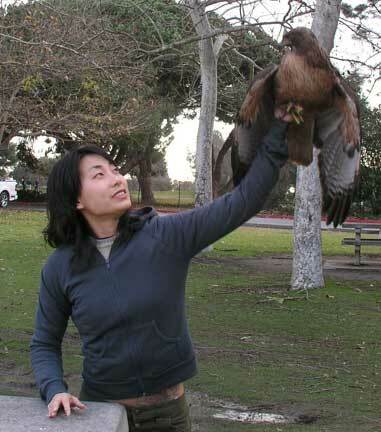 Another UC Davis student extern, Lisa Hsuan, had an opportunity to work on a red tailed hawk. The radiograph showed no internal problems. We teach these students how to read radiographs on wildlife, something they do not routinely get in veterinary school. Take a look at this opossum and see if you see any problems. 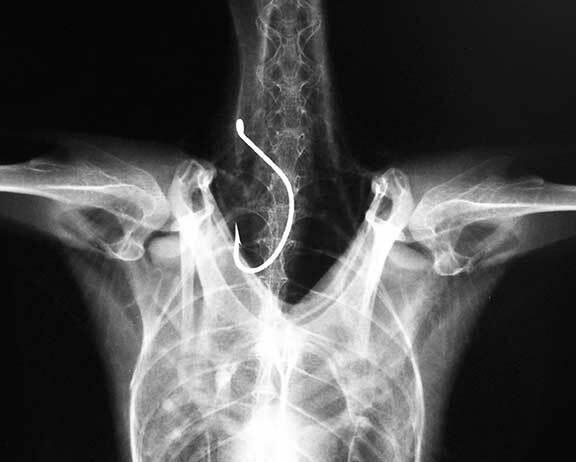 This opossum has a severely fractured spine, visible at the top left of the radiograph. This very serious injury is not correctable, so it was humanely euthanized. Click on the radiograph to make it larger and see if you notice anything else about this opossum. This is Liz Whitsett, another one of our externs in 2014. She spent several weeks working with a duck with an injured neck. This video shows you the dedication she had to helping rehabilitate this duck. This is Kellie Davis, a future veterinarian-to-be working on a pelican with Julio. When you bring us injured wildlife we need you to fill out a Wildlife Rescue form. This keeps us in compliance with Fish & Game Regulations, tells us where you found it and what you did for it, and gives us a medical record. After we provide initial medical and surgical care, our goal is to release these patients back into their native habitat or send them to licensed rehabilitators. Be cautious because wild animals are very quick and powerful. They have strong instincts to protect themselves and can inflict serious injury. Be particularly wary of shore birds with pointed beaks and birds of prey with strong talons. They can inflict serious eye and bodily injury. Call your local animal control authorities to see if they can capture the animal. When captured, place it in a box, keep the box covered and in a warm spot, and keep children away. These animals can easily die from fright, so keep handling and observations to a minimum. Do not attempt to provide medical care. What seems to be such common sense treatment for our personal pets or us humanoids does not carry over to wildlife. Call us to make sure we are open, and bring the animal to us during our regular office hours as soon as possible. If we are closed, keep it warm and covered until we are available. In the springtime many baby birds are brought to us that have fallen out of a nest. Unless they are obviously injured, it is best to leave them alone. The odds of them surviving are much greater if you put them back in the vicinity where you found them. Put them back into the nest if it is available. Your smell on the bird will not bother the parents. If the bird is on the ground and there is no nest, leave it alone, because the parents are watching it. Even though we like feeding cuties like this baby hummingbird, it is not injured, and its best chance for survival would have been to leave it where it was found prevent animals like cats from injuring it if it is on the ground. Unfortunately, if you are able to catch a wild animal, it is usually seriously injured. Their prognosis is very poor in this advanced state of disease. Unfortunately, we cannot save all of them due to these serious injuries. This is the case with the sharp shinned hawk below. This is what it actually looked like, after it was cleaned up. It is infected and the upper bone is discolored and non-vital. The bird has probably been in this state for a while before being brought in to us. The prognosis is poor and the bird was humanely euthanized. This page contains the wide variety of injured wildlife treated at our hospital since 1989. Take your time and pace yourself because there is lots here to learn about. This duck was brought to us with a bum wing that it could use at all. It had a great personality, so we took a radiograph to determine the extent of the problem. The humerus (upper arm bone) has an old and severe fracture. This wing is painful and non-functional. This fracture is not surgically repairable, and we knew we had to amputate the painful wing. This duck could not survive in the wild with only one wing. This duck had a great personality, and we were able to find someone that would care for her since she could note be released back into the wild. We treated her with pain medication and supportive care for a few days to get her stronger in anticipation of surgery. The duck adapted to us quite well, and loved the 3 full meals (and Netflix movies) it received each day. On her surgery day she was given a pre-operative exam to make sure she was ready for the anesthesia and surgery. She passed with flying colors. The heart and lungs are important organs to check in regards to anesthesia. She seemed to know we were helping her, and sat still for her exam. We gave her a pain injection just prior to her surgery. She remained calm the whole time, completely trusting us. Now the fun part of plucking (we don’t clip bird feathers) all those feathers begins! We used our carbon dioxide laser for this surgery. Amputations can be bloody, since we are going through muscles and many blood vessels. We are even going through the brachial artery, a large artery that supplies the wing. The laser dramatically reduces bleeding, which is advantageous because this reduces surgery time. For the patient, there is substantially less pain, swelling, and inflammation after surgery. Its the only way to go for a surgery like this. The cut muscle is the white tissue between the clamps. Notice the lack of bleeding at the muscles. Dr. P gave his assistant surgeon, our extern Michelle Greenberg, an opportunity to experience the laser. She is a lefty, so he had to think backwards when he guided her on where to incise the muscles and skin. The procedure went as expected, and our friend woke up with much less pain. Hopefully we have enough food to keep her happy until she goes to her new home! The morning after surgery she was eating good and obviously felt better. With a little more rehab and rest should would soon be good to go. She is still lame on her left leg, and does not bear complete weight on it, or walk for very far with her weight on it. We have her on a pain and anti-inflammatory medication to help. We also do rehab with her twice each day. After rehab we take her outside in the sun and let her do her duck thing. The buoyancy of the water helps with her leg problem. For some funny reason we get the impression she enjoys this. Not all fractures are as severe as the duck, and can be treated with a splint. This Peregrine Falcon was brought to us with a wing injury, as noted by its inability to fly and drooping wing. After a thorough physical exam a radiograph was taken. We splinted the wing and will be sending it to South Bay Wildlife Rehab for care. It will return periodically for exams and radiographs to assess the healing, and hopefully will be released back into the wild. Long Beach Animal Control received a call about a bird hanging from a bridge in Long Beach. When the officer got there she saw an owl hanging by its wing. She called the Long Beach Lifeguards for assistance. They brought equipment to remove the owl. It was brought right to our hospital for medical care. The first thing we do after our rapid and immediate physical exam (after removing the fishing line around the wing) is to warm the owl up, give it warm fluids for shock, and let it rest from its ordeal. It was given several medications to help it heal faster and minimize the pain in its wing. When it was stronger we took a radiograph. Fortunately, it did not have any fractures. We kept the owl for several days to make sure it was healing well and eating on its own. Once we were sure it was on the right track we transferred it to South Bay Wildlife Rehab. We have been working with them for many years, and they are an invaluable part of our work. Without their dedication, experience, and knowledge, we would not be as successful as we are in our Wildlife Program. After resting, healing, rehab of the wing, and eating lots of meesers (mice), and a recheck exam by Dr. P and Dr. W, the owl was ready to be released. We gathered everyone involved for a final farewell to our friend, and released it back in the area where it was found. When the time was right, and Dr. P had the camera’s rolling, it was released. It was obvious from the beginning that the wing was 100% healed when it flew off into a palm tree 100 yards away from where it was hanging from the bridge when found. A sparrow made a landing at the wrong airport and got stuck in a glue trap. This is a very serious condition that frequently results in death due to exhaustion and shock. After he was stabilized and warmed up, we gently removed him from the trap with Eaze Off and mineral oil. Then we gave him his first washing and let him rest. We need to remove all the glue from his feathers, and then let him preen, to bring his feathers back to normal function and repellency. Off to a bath with warm water and dilute Dawn detergent. We need to get all of the adhesive off for him to return to normal function. This might take several washings. Another day with us to preen his feathers to return their water repellency, and he should be good to go. He gave us a big thanks, and said he would bring donuts next week next time he flies by. This hawk was brought to our wildlife program with a drooping wing. 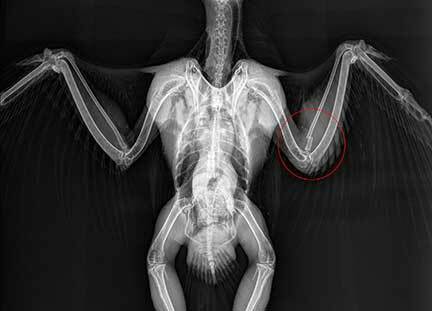 It is imperative to minimize stress on raptors, so after stabilization and exam a radiograph was taken. Did you see the fractured ulna at the red circle? This cute guy was presented to us by a good samaritan. The goose was unable to walk at all. After a thorough exam, assessment of why it could not walk, and therapy for shock and dehydration, we radiographed the rear legs. You can readily see the fractured metatarsal bone. It turns out both rear legs had this same fracture. It was decided that surgical repair using an IM (intramedullary) pin was necessary to fix both legs. These pins are made of stainless steel, and are not reactive. Sometimes we keep them in after the bone has healed, sometimes we remove them. The bandages aid in healing, prevent further trauma, and make the bird more comfortable. We change them often to assess the surgery site. We routinely have senior veterinary students observe in surgery. You can learn more about them from our web site, and especially our Facebook page, where they post a daily diary of what they learned for the day. Downtown Long Beach has many pigeons, just like many cities. This means there are Peregrine Falcons, living on the ledges of the high rise buildings, also. We see them frequently, usually due to some trauma. A lateral radiograph revealed prior injuries. There is a pellet in the chest and a BB in the right femur. It was determined that the pellet in the chest was not causing any trouble. The BB in the leg was inside the marrow cavity of the femur, so it was left alone. Taking it out might cause more harm than good. The falcon was standing on the leg well and had adequate talon strength, so it was stabilized and sent to a falcon rehabilitator for long term care before release. Owl with blood in eye. Technically, this is called hyphema, which is blood in the anterior chamber. The cornea and lens were ok, and this owl was treated with topical eye medication and supportive care until it healed and was released. Some birds are so young and tiny it is hard to determine what they are. We fix em up anyway! Sometimes people bring us injured wildlife that even amazes Dr. P! Someone brought in this butterfly that was unable to fly. 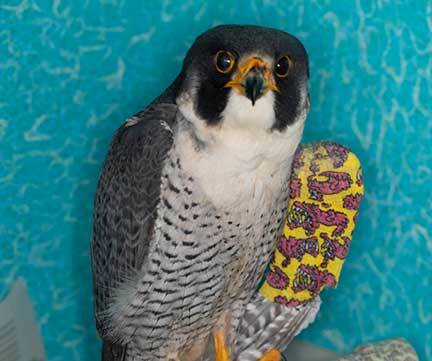 A Peregrine Falcon from downtown Long Beach was brought to us because it could not fly. The fact that someone could catch such a flighty bird indicates it could be severely injured. We took a radiograph to look for fractures or internal injuries. You can see the tremendous detail we get from our digital radiography (click on the photo for a larger view). This red tailed hawk had a traumatic fracture of its radius and ulna. It was repaired with an intramedullay pin and sent to a rehabilitator for 30 days. The pin was removed and the hawk went back to the rehabilitator to strengthen the wing and flight muscles in the hope of releasing it. A good samaritan found this weakened pelican in Long Beach. It had a serious and chronic laceration of the neck that penetrated the esophagus. When suturing we have to carefully dissect the esophagus away from the skin or the esophagus will never heal. We also have to remove the dead tissue at the edges of the esophagus for healing to progress. We use a special suture material that is strong, causes minimal chance of scarring the extremely sensitive esophagus, and will eventually dissolve on its own. 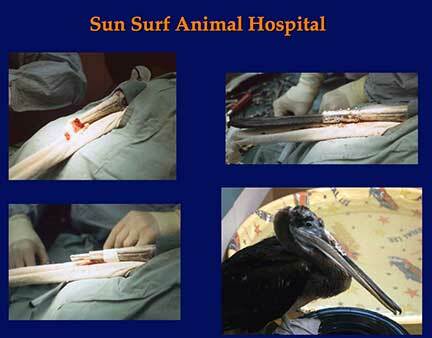 We doubt this pelican will keep its suture removal appointment! We infused the area with local anesthetic and carefully repaired the laceration. The bleeding is a good sign, and tells us there is adequate blood flow to allow healing. After a few days of rest, and lots of grueled mackerel, our friend was strong enough to be released. We took him to Marine Stadium in the late afternoon. This little duckling came to us severely oil soaked. This is a dangerous situation that commonly leads to death. Death is a result of hypothermia, ingestion of toxic oil, and the loss of water repellency by the feathers. Do not try to remove the oil at home because professional care is necessary if they are to have any chance for survival. This little guy was completely coated in oil. He had quite the personality, so we nicknamed him Yacky. The washing process is carefully orchestrated to minimize stress during this critical stage. Many washings are needed to eventually remove all of the oil. Yacky is one of the lucky ones because the people that found him brought him in immediately. Unfortunately, this is not always the case. An immature red tailed hawk was brought to our wildlife program by the Department of Fish and Game. It was confiscated from people that were inexperienced in dealing with this type of bird and were caring for it poorly. This is in violation of California law. X-rays revealed a BB in the eye. It is unknown to the Fish and Game officers who shot the bird so maliciously. In addition to the serious eye injury, this bird had two additional problems, both due to inadequate care. The people that were caring for this bird were not experienced at handling a hawk, and added to this bird’s woes. Its feathers were also damaged. This will take a long time to repair itself because of the manner in which birds molt. One of the precautions we took while the hawk was hospitalized is to protect the tail feathers, an area that is easily injured in captivity. This apparatus is called a tail card. It is made up of used x-ray film, making it both light and strong. The hawk and x-rays were sent to one of our colleagues that specializes in eye injuries. He decided that the eye was stable and that any intervention would not help, and may even make the problem worse. After we corrected the dietary deficiencies the bird was released to a licensed rehabilitator. He will utilize his extensive experience and try to teach this bird to hunt with only one functional eye. We will keep you posted as to the outcome of the hawk and people that caused this problem. It turns out that the people that brought the hawk to Fish and Game were the ones that shot it, and they were prosecuted. An albatross with a fractured shin bone (called the tibiotarsal bone in a bird) was found at Los Angeles International Airport (LAX) and brought to our clinic for care. Upon initial examination we realized this bird had a serious problem. Survery radiographs revealed a fracture (arrow) of the tibiotarsal bone. Closer inspection of this radiograph revealed several bone fragments. This is a serious injury that requires surgical correction. An albatross needs to run a long distance before it is able to get off the ground, so any repair of this fracture must be performed with great care. Undertaking a repair of this nature is a team effort. Heather and Melinda, our current externs, are monitoring anesthesia and assisting our surgeon with any of his needs. Wild birds are highly stressed when in captivity. In addition, any wild bird with a serious fracture that undergoes anesthesia is a high risk patient. Several precautions are taken during the anesthetic procedure. In this picture you can see the tube that is placed in its windpipe (trachea). This allows us to administer 100% oxygen and give the anesthetic in very refined quantities. It also allows us to ventilate the lungs with oxygen if respirations become depressed. The heart rate and oxygen saturation of the red blood cells are measured continuously during the surgery with an instrument called a Pulse Oximeter. It gives us an early warning indication of any problems. This picture shows a hemoglobin saturation of 93%, a heart rate of 167 beats per minute. and 4 bars for pulse strength. These numbers are well within the normal range. All birds that undergo anesthesia are in serious jeopardy of hypothermia. In this picture you can see the 3 strategically placed hot water bottles (arrows). In addition to these bottles, all birds that are put under anesthesia are placed on a warm water blanket. Careful preparation of the surgical site is necessary to prevent any bone infection, a serious complication that could easily prevent healing. All the feathers around the area must be carefully plucked and the skin cleansed meticulously. We pluck the feathers instead of clip them so that they will grow back faster. These birds have large muscles in relation to their bones. Our surgeon is carefully dissecting the bruised muscle in order to get to the fracture site. Repairing the fracture is of no use if the surrounding muscles, tendons, ligaments, or nerves are damaged. You can visualize some of the cerclage wires that are wrapped around the bone fragments to hold them in place. The black arrow points to a nerve that runs downward from the tip of our surgeon’s finger. Preservation of this nerve is critical. Once the fracture segements are in place with the cerclage wires, a pin (called an intramedullary pin) is placed down the shaft of the bone. In this picture our surgeon is holding the bone with clamps while his assistant is inserting the pin from the right side of the picture towards the left. Even though there are wires around the bone and a pin down the center, the fracture is still not stable enough. Four pins are placed on the outside of the bone to prevent the bone fragments from rotating. The four external pins are connected by a special acrylic. It has to be mixed to just the right consistency. The four pins (the 2 left most pins are visualized in this picture by the arrows) are connected with a hollow tube. The acrylic is squeezed into the tube and allowed to harden. This keeps the four external pins rigidly in place, and prevents the fracture site from rotating. The post operative radiograph gives good visualization of how the fractured bone was repaired. On the left you can see the tube that is filled with acrylic and the four pins that are attached to the acrylic tube externally. On the right you can see the fractured tibiotarsal bone with the four cerclage wires and the intramedullary pin down the center of the bone. To prevent thrashing when awakening from anesthesia the albatross is gently wrapped in a snug towel. It is kept in a warm room until it is fully awake to prevent loss of excess body heat. The day after surgery our friend is awake and alert. She is kept in a confined cage initially to prevent her from trying to fly or even use the leg. She will need several months of postoperative care before she is fully healed. Her intramedullary pin and her external pins with attached acrylic will all need to be remove if the bone heals. The cerclage wires on the inside will stay with her for the rest of her life. At this point we will be working with AWRE for her long term care. Come back to this site periodically to check for updates as to her condition. Our ultimate goal is to release her back to the wild (and to find enough food to feed her!). Donations of squid, mackerel and smelt are always welcome because she needs lots of calories if she has any chance of healing. Click on the AWRE address below to learn more about this albatross. A good samaritan found a weak heron and brought it to us for assessment. We saw a wound on the side of its neck. Once it was stabilized we assessed the neck wound, which was more severe than originally appeared. It has a severe laceration to its esophagus, a potentially life-threatening situation. Now the process of building up its strength and making sure it can use the esophagus began. After several days he continued to do well and was ready for release. The heron was taken to an area on Long Beach near to where it was found. Dave Thraen and Dr. Petersen had the honors of releasing it since they did most of the work. This is Archimedes, a sawhet owl that died in July, 2000 who was the mascot for AWRE. You can learn more about him by going to the AWRE web site. The address is: http://www.awre.org The Long Beach Animal Hospital supports the non profit AWRE, and provides medical and surgical services for this worthy organization.